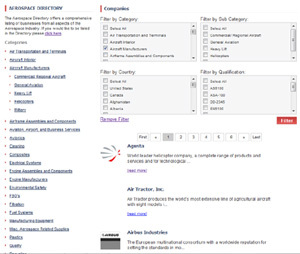 Suppliers of aerospace products and services use their directory page to distribute information about their business. In addition to giving basic company information, you can find marketing materials, videos, and other important documents on any company directory page. The Aerospace Directory can be browsed by anyone and is searchable by product, location, business category or even special qualifications.